Shiatsu massagers will help make your day easier with their soothing vibration and gliding strokes. The shiatsu motion eases and calms your muscles. This can provide relief from tense muscles and neck pain. The soothing massage can also help you find an escape from intense stress. It is important to note that the market has way too many massagers that are just fancy vibrating gadgets. You want the best shiatsu massager for your buck which will work efficiently in giving you a great massage. To help you find one that works best for you, we found eight amazing massagers that you can find in the market. You might be stuck in picking the right massager of you. In this case, you just need to keep an eye out for several key criteria among the different kneading massage units in the market. What is Shiatsu massage if it cannot soothe your body after a hard day at work? You want a unit that can deliver a good deep tissue massage that works your muscles into a relaxing gooey state. The number of rolling notes can determine the unit’s performance. More nodes can deliver a continuous movement across your troubled area. You will also want nodes that have a large smooth area that covers a wide part of your body as it moves around your neck or back. Shiatsu massaging cushion with heat can promote good blood flow in your neck or back. This helps you relax and find relief for intense stress and pain. On the other hand, the added heat on the nodes might not be comfortable at certain times. You will want a massage pillow or mat that lets you turn the heat on or off. One of the concerns that people have with the heated appliance is the chance of a short circuit that can rapidly increase the temperature of the device to abnormal levels. You should always consider the safety features of a shiatsu back massager pillow or mat when deciding which to buy. These features include an automatic shutdown function that kicks in when a massager becomes too hot. The portability factor depends on whether you want to take your massager anywhere. This not only includes your home or office but other places as well such as on a cruise vacation. A massager’s portable design depends on whether it can fit into the small spaces inside your bag or car. With this in mind, massage pillows are your best bet for a shiatsu experience that you can take anywhere. If you only want to use the massager in one place, portability will be the last thing to consider when picking which unit to buy. Some people might not be comfortable with how strong a massager can be. Others may feel that a unit is not providing enough pressure to their muscles. Whichever is the case, you want a unit to give you a personal shiatsu massage experience that you can enjoy. This is where the control factor comes in. Many units let you adjust the kneading speed of the node or allow you to activate/reactive the heat. Some massager provides a more personal experience by moving the nodes to a specific part of your back. Massage with a versatile design allows you to knead other parts of your body apart from your neck and body. This factor lets you target your ankles, waist, wrist, arms, and things. Massage pillows are a good example of a unit with a versatile design. You can place the pillow below most parts of your body that you want to experience a shiatsu kneading massage. The Zyllion Shiatsu Back Neck Massager Pillow uses four rotating nodes that provide a deep-kneading action to your body. This targets the problem area of your neck or back and offers relief for tense muscles. The nodes change its rotation direction to create an efficient kneading massage. Its ergonomic design fits the rotating nodes to your neck and back. Apart from the rotating node, the massager also creates a warm surface to the contact point to your back. This creates a heat compress therapy that further provides pain relief to your body. This also increases the blood flow to your neck or back to encourage the natural healing of your system. The compact pillow design lets you take the massager anywhere, even in your car. The adjustable strap lets you secure the Zyllion Massager to your car seat or office chair. You can also enjoy the leather material of the outer edges of the pillow. The Zyllion massager will work its magic at the touch of one button. In terms of safety, the unit will shut off automatically when it detects an abnormal increase in temperature. If you happen to fall asleep, the unit will automatically turn off in 20 minutes. The Zyllion massager tops our list because of its efficiency in providing a good shiatsu massage. The movement and pressure of the nodes are just right in easing tense muscles. With the added warmth of the note, you get a heat compress treatment to your back. We also like the safety measure of the massager in case something goes wrong with the unit. The only flaw we can see with the unit is the lack of options to adjust the speed of the node. There is also no switch to turn on or off the heat. Etektcity Massager features eight nodes instead of just four nodes as other massagers. This leads to double the kneading performance than other models. The nodes also switch directions. Its deep tissue massage makes it seem like an actual person is providing the massage. In addition, you can add heat to the node with a press of the switch. This function creates a hot compress effect that promotes better blood flow in your neck or back, which provide better pain relief. The Etekcity Massager’s portable design allows you to take the unit anywhere with you. Its elastic strap works with different types of chairs. This unit also comes with a removable cover that is easy to remove and put back. You can clean the cover with any washing machine. You can control the speed of the massaging nodes with the secondary button. Even the heating function is controllable through the power button. In addition, the unit has an auto-shutdown function that activates when the massager becomes too hot. Etekcity Massager will also turn off automatically after 20 minutes. You definitely get the most value out of your money with the Etekcity Massager’s eight massage nodes and heating function. Each of the four dual nodes gives just the right continuous pressure on the muscles to ease away any tense part. In addition, you have more control over the speed of the nodes. You can also disable or enable the hot compress function. Despite many of the functions and features of the Etekcity Massager, the end of the node is the unit’s slight flaw. The pointed tip only provides pressure to a specific point on our body. If the end is wider and more rounded, the neck massager pressure gets an even distribution across our body. The NekTeck Deep Kneading Massage Pillow delivers an effective kneading performance with its dual strap design. By pulling down on the two straps, you allow the massage nodes to deliver a deeper kneading action by adding pressure to the nodes. The strap design lets you attach the pillow to your back, arms, legs, or other parts of your body with ease. Adding to the efficiency of the massager, there are eight rotating nodes instead of just four. This creates a continuous motion of pressure points that ease your muscles. This massager has three different speed settings that provide different massage effect. The unit also creates a heated surface to promote better blood flow within the troubled sections of your body. You have full control over this with the four button control panel on the side of the NekTeck Massager. You can allow the massager to run without stopping or activate the automatic timer function. This will make the unit run for 10 minutes before shutting down. In addition, the unit has a safety mechanism that turns off the massager if it overheats. In terms of performance, the NekTeck delivers with its functional dual strap. The pillow hugs your neck tightly as you pull down on the strap to provide just the right pressure. You can easily fit the pillow around other parts of your body thanks to the dual strap design. This massager also provides more controls over the function of the unit, including the option to let the nodes run indefinitely. While NekTeck is the best functioning massager in the list with its dual strap, it is not a portable unit. Unlike other slim pillows, the NekTeck massager does not fit into all bag sizes. The Snailax Neck & Back Massager targets nearly most of the troubled area at the back of your body. The upper part of the unit has four rotating nodes that deliver a deep tissue kneading action to your neck and head. This unit’s middle portion of the unit has four additional nodes that rotate and move around your full back. You also get a vibrating node at the bottom that targets your thighs, hips, and tailbone. You have the option to apply heat at the upper and middle nodes to create a hot compress massage to your body. The remote control unit of the Snailax Shiatsu Neck & Back Massager gives you full control over the unit’s performance. You can turn on the upper or middle nodes only or have all eight running at the same time. The controller also allows you to set the middle massaging nodes to work on certain parts of your body. You can even activate the heating function or not while the nodes are providing a shiatsu massage. You can easily detach and attach the covers for both the upper and middle parts of the Snailax Shiatsu Neck & Back Massager. Both covers are washing machine safe. In addition, the versatile design of the massager lets you fit the unit on nearly any chair at home or at the office. This massage chair works as promised. It delivers deep-kneading motion to your neck and back simultaneously. You also benefit from the bottom vibrating motion that targets your hips. With the heated surface of the nodes, you can tackle most parts of your body for better pain and stress relief. What limits the Snailax Shiatsu Neck & Back Massager is its bulky design. Carrying the unit to the office and back home is not feasible for any of our team that commutes. The Naipo Shiatsu Massager features an ergonomic design that lets you secure the unit close to your body for better deep tissue kneading. The design also allows you to fit the pillow to nearly any part of your body that needs a shiatsu massage. This unit also uses eight massage nodes instead of just four. The multiple nodes create a 3D motion movement that eases your muscles and nerves for better pain relief. In addition, the massager has a hot compress feature that improves the blood flow on your troubles areas for better healing. If you do not want the heat, you can just turn it off with the control panel. What makes the Naipo massager standout is the premium PU leather that creates a luxurious aesthetic look. This unit also uses a breathable 3D mesh that allows more heat to transfer onto your body. This makes the unit better at promoting better blood pressure than other massage models. Speaking of heat, this model has a safety feature that turns off the massager if it reaches high-temperature levels. The versatile ergonomic design and eight rotating nodes give the Naipo Massager a spot in this list. You can use the pillow to deal with neck cramps, aching wrist, sore feet, and much more. The leather PU material is icing on the cake in regards to the performance of the unit. The flaw of this unit is the same as other massagers with similar ergonomic design. The size makes it hard for you to fit the unit in most of the bags we use when going on a long trip. Traveling with the Naipo Massager require plenty of room in our bags. The Invospa Massager also has a dual strap design and uses eight rotating nodes. The design lets you fit the unit to your neck, back, and waist. You can also wrap it around your thighs, foot, wrist, and arms. Pulling down on the dual straps allow you to add more pressure and increase the efficiency of the unit’s deep-tissue massage. In addition, the nodes can create a heated surface that further soothes your muscles and nerves. This heated massager has an automatic shutdown safety feature that activates when the unit gets too hot. It will also turn off the unit within 15 minutes of continuous use to prevent overheating. The Massager has most of the checkboxes marked for the best massaging pillow in the market. This includes eight rotating nodes and a heated surface. You also have full control over the unit’s performance with the side control panel. However, the large dual strap design makes it hard to fit the unit in most of our travel bag. This makes the unit less portable than other massagers in the office. Fortunately, the Invospa massager comes with a free carrying bag. The Gideon Massager Mat provides a full back kneading action with eight rotating nodes that travel up and down the mat. The nodes create a 3D kneading action that penetrates your muscle fibers. You will feel like a licensed therapist is targeting the tense and painful part of your back. The heating system on the nodes provides a therapeutic compression to your muscles, which helps decrease pain levels to a minimum. In addition, the bottom part creates a soothing vibrating motion that targets your thighs, hips, and tailbone. With the remote control unit, you have total control over your massage experience with the Gideon Mat. You can stop the massage nodes at any part of your back that requires more attention. If the heat is too much, you can turn it off at the touch of a button. The Gideon Massager Mat allows you to work on every tense part of your back without having to adjust the unit like massage pillows. With the included remote control, you can easily set the type of shiatsu massage you need at the moment. In addition, the versatile design of the mat allows you to place it in most type of chairs. Unfortunately, Gideon’s mat can only provide a shiatsu massage to our backs only. Other massage seat cushion can work on both our back and neck at the same time. The standout feature of the Nursal Massage Seat Cushion is its four dual-massaging nodes. Four of the rotating nodes move from the middle and upwards while the other four moves in the opposite direction. 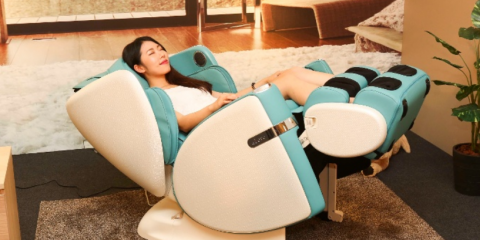 This creates a simultaneous full back massage experience that actually feels like two massage therapists are working on your back. 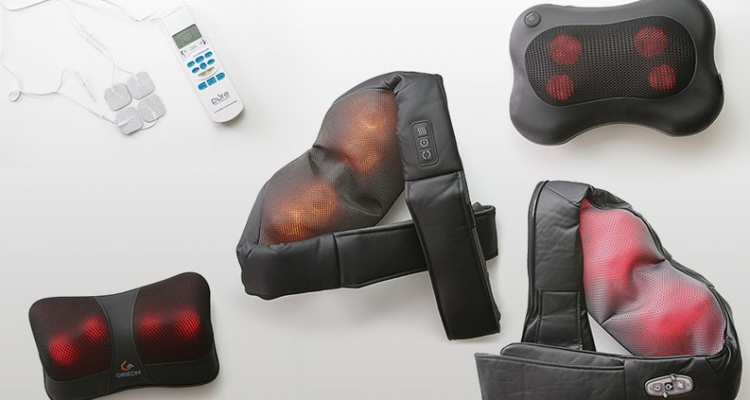 With the heated surface of the nodes, the massage seat cushion eases away the pain and tension. You also get a vibrating motor at the bottom part of the mat that soothes your hips and hamstrings. Another notable feature of the Nursal Massage Seat Cushion is its thin and light design. This allows you to slide it into the thinnest space of your vehicle when you want to get a shiatsu massage at work or while driving. The four rotating dual-nodes is why the Nursal Massage Seat Cushion gets a spot in our list. Unlike other mats with eight nodes, Nursal units cover more parts of your body simultaneously. You can also control which nodes to move so you can target a specific area of your back with the remote control. The only thing missing in this massage seat cushion is a neck massager. We believe that adding two more rotating nodes at the top can provide a better shiatsu massage experience. Shiatsu massages involve applying different points of pressure to your body. In the country of its origins, this therapy balances your body’s energy pat​​hway. You might think that massagers are only great when your muscles are aching. However, these have a much wide range of uses apart from just providing pain relief. The soothing motion of the deep tissue massage can help you get over insomnia. If you have any problems with sleeping, take a shiatsu massage session for 10 minutes before going to bed. Apart from treating insomnia, a massager can cool you down when you get angry. The relaxing deep tissue massage makes your body release endorphins to make you feel like everything is going your way. This is also why massagers a great way to treat depression. There is such a thing as too much of a good thing. Constantly using a massager may make your body used to the deep-tissue pressure. This may lead to decreased benefits such as the release of endorphins to your system or with how the heat promotes blood flow. A good rule of thumb is to use any of the massagers at least three to four times a week. See how your muscles and body respond to the shiatsu therapy to gauge if it is still providing a relaxing experience as before. If you think three or four uses a week is too few, consider increasing it to five days. This will help ensure that you can experience pain relief and better mood improvement when using your shiatsu massager. Final Word: You now know some of the best massaging units in the market. Consider the important criteria listed above to find the right massager for you. Out of all the units in the list, the NekTeck Deep Kneading Massage Pillow stands out for its performance and portable design. Check out our page www.blissfulrelaxation.com for more massager reviews.